Mission US is a multimedia project featuring free interactive adventure games set in different eras of U.S. history. 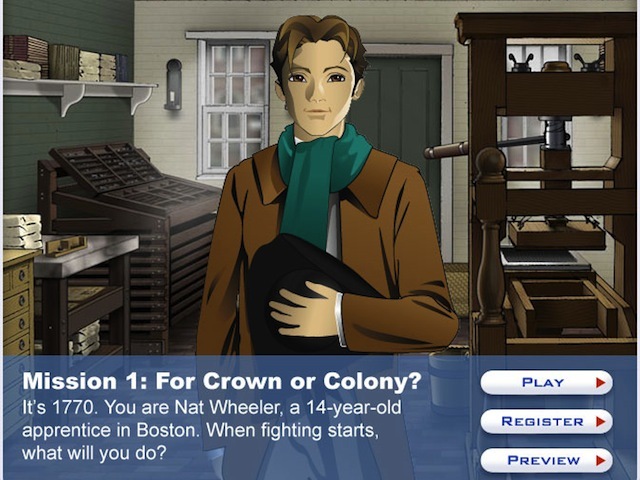 The interactive, “For Crown or Colony?” puts students in the shoes of Nat Wheeler, a 14-year-old printer’s apprentice in 1770 Boston. As Nat navigates the city and completes tasks, he encounters a spectrum of people living and working there when tensions mount before the Boston Massacre. Ultimately, the player determines Nat’s fate by deciding where his loyalties lie. Mission Us is an opportunity for 6-8th graders to jump into Revolutionary Causes in Social Studies. My 3rd grade son liked it more than Mario Brothers Wii.